What will our children know? 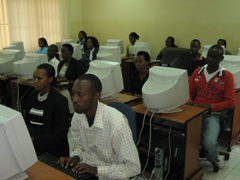 Educational outreach is central to Voices of Rwanda’s mission. It is imperative that young adults gain an understanding of genocide and the conditions that give rise to it. To accomplish this, testimonies from the archive will be used to create a genocide curriculum for high school students across the United States. The video library will also be made available to museums, schools, and other learning institutions worldwide. It is Voices of Rwanda’s hope that greater awareness about genocide can help future generations and leaders take decisive action and ultimately, prevent such atrocities. 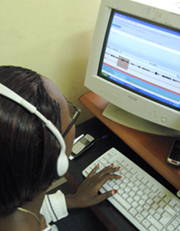 As vast amounts of material are being collected, Voices Of Rwanda is also designing innovative tools to make the testimonies highly accessible. The audio-visual content of the archive is aligned with written transcripts, enabling the entire collection to be browsed using the spoken content of the video testimonies. With this process, relevant search results can be presented as precise video clips, in addition to full testimonies. Furthermore, the transcripts will be linked to geographic interfaces and visual timelines. These technological features will provide those who may not be literate or familiar with traditional Boolean searching with other ways to explore the video collection and ultimately allow for a more democratic access to the stories. For information about how to bring testimonies to your school, email us. Voices of Rwanda is dedicated to recording and preserving testimonies of Rwandans, and to ensuring that their stories inform the world about genocide and inspire a global sense of responsibility to prevent human rights atrocities.